Flying isn't something I particularly enjoy. Don't get me wrong; I feel incredibly lucky to have the opportunity to travel for work and I always love the destination, but being on a plane and dealing with the stress of TSA and catching a flight on time isn't my idea of fun. So I have made it my mission to make the whole process as simple and seamless as possible. That includes packing a carry-on with travel essentials that can make economy feel like first class, and airport outfits that are cozy and comfortable but also chic and cool. I drew on my in-flight experiences to compile a handy list of my personal favorites, and I split it up into two sections: what I take on board and what I wear on board. Hopefully, this will also help you make a stressful flight more enjoyable and fun too. Read on to see the 32 things I never board a plane without packing and wearing. I am obsessed with this eye cream. 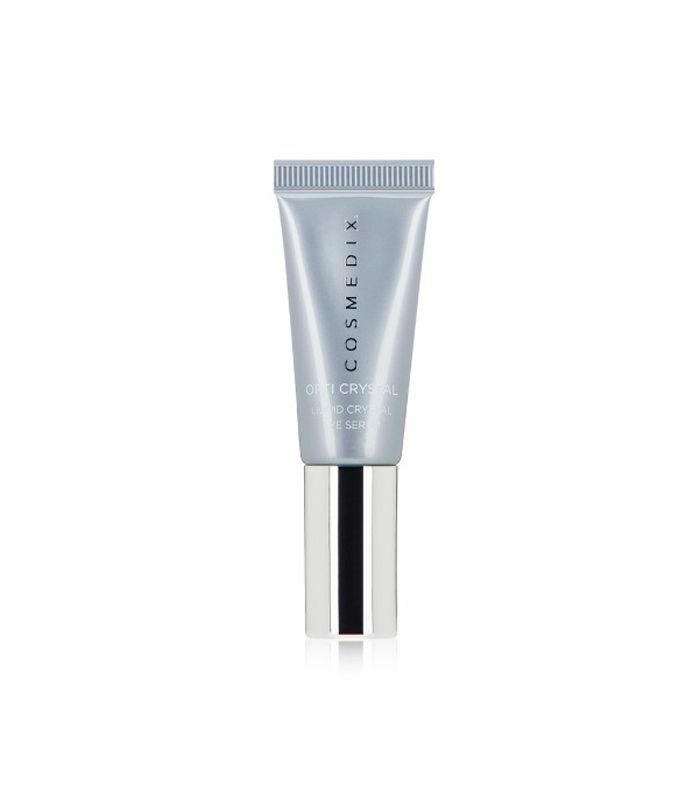 It has an opalescent appearance, so when you pat it under your eyes it reflects the light and acts as a highlighter. I love putting it on my lips too. It's incredibly hydrating and feels really good on my skin. This perfume collaboration with In Fiore and beauty icon, Violette not only smells divine but the compact is also impossibly chic. It has a little mirror too so you can use it for touch-ups. Since it's a solid perfume, you can happily carry it on board without stressing about spills and smell good the whole flight. I always carry my Sakara Life beauty water with me everywhere. Since you can't take bottled water on board, I like to add this to supercharge the water I'm served mid-flight and make it taste better too. This concentrate has 72 trace minerals and tastes like roses. If you follow me on Instagram, you'll know how much I love the new La Prairie In-Essence foundation compact. I'm more of a skin person than a makeup person generally, but this foundation has changed that completely. It is so incredibly weightless, hydrating, and makes my skin look like my skin, just better. It's honestly all I wear. The small size with the mirror inside means you can get on the plane make-up free then apply it on board before you land so you feel fresh and glowy. I never travel without a hydrating mist. It keeps my skin from drying out in the cabin air. This True Botanicals nutrient mist is my new favorite. It smells great and is completely clean and natural. I'm not a light traveler. No matter how hard I try to streamline, there's always a product I simply can't live without. But I do keep my luggage to a minimum. I always travel with a crossbody bag, and this Leatherology one is a perfect size: not too small and not too big either. It fits my credit cards and cash along with my perfume, face mist, lipstick, comb, and phone. I always bring a beauty travel case with me on board for all the skincare I need. I really dislike the dry cabin air, so I carry a lot of hydrating serums and masks. The clear window on this case allows me to see what I have at first glance. I don't have a lot of time to apply makeup on most mornings, let alone when I'm about to board a flight, so I've streamlined my routine to five minutes or less. I apply La Prairie, as mentioned above, and then use this cream blush and highlighter to bring a little color to my skin. This is so creamy and pigmented, but also really light and 100% natural too. I was only recently introduced to Bite Beauty, and it's safe to say I'm obsessed with the clean beauty brand now. This product is my new favorite because it's really pigmented like a lipstick but soft and hydrating like a lip balm. I like to pat it into my lips for a softer stained look. And the color really lasts without drying my lips out like most brands I've tried before. Even if I'm not on a red-eye, I always pack soft foam earplugs. Sometimes I need to nap and I like to block out a lot of the noise. It just helps to dull the chatter and lulls me to sleep. I sleep with a silk eye mask every night and also travel with one wherever I go. You just never know when you'll need a little nap. This is one of the best vitamin B serums I've ever used, hands down. I'm always mixing up the serums I travel with—here are some of my favorites—but right now this one is on high rotation. I like my travel luggage to be durable and light but still have the capacity to hold a lot. This Oliver Thomas one is all three of those things, and more. It's one of the best travel bags I've ever used. Why? It's really all about the internal organization. There is an extra compartment on the outside of the bag for shoes, it has a secret stash section on the bottom, and three mesh pockets. It also has an external trolley sleeve, which is a gamechanger. It's small enough for you to use as a carry-on but it's also tough enough for you to check in too if needed. This stylish roll-on has ginger root, lavender, and geranium to keep you feeling calm and ready to fly. The soap at airports and on the plane can be quite harsh on your hands, not to mention the extra hand sanitizer you're using. I always bring a hand cream to replenish them when needed. This one also smells insanely good. Before I do anything, I clean my tray table, the back of the seat in front of me, and the arms of my seat to minimize my contact with bacteria and germs. These are natural and they're wipes,which is very handy for traveling. There are a lot of carry-ons out there, but the Away aluminum model is not only practical but seriously chic. I also have this in the medium for longer trips when I need to check it, and it's always easy to spot on the luggage carousel when you land. Very handy. I have always suffered from fluid retention and I always hold water when I fly. I've been testing this new oil by Olio Maestro for the last few months, and it really works. I apply it before I get on board (and bring it with me so I can apply again when I'm on and when I disembark). The natural essential oils and active ingredients in this potent body oil actually melt fluid retention. It honestly works and has changed my life. This creamy balm is great for dry lips or any dry areas on your body and as a super-hydrating mask mid-flight. I take it with me everywhere. I have been wearing natural deodorants for years now but was recently introduced to this brand Corpus, and aside from its really pretty packaging, it smells great and works to keep my underarm sweat to a minimum too. I always take one on board with me so I can reapply mid-flight and when I land. I often travel in leggings because they're just so comfortable for flying. The P.E. Nation styles are my current favorites because they're slightly high-waisted and the lycra really sculpts your legs like compression tights, which I love. They also look really cool without being too trendy. I often wear a graphic tee to the airport because it's casual yet cool. This Anine Bing vintage-style tee is on my hit list. I am always cold on the plane, so I typically wear a fitted long sleeve underneath my tee. This Nike one is so soft and comfortable that it feels like my second skin and is a really great layering piece. I usually wear a hooded sweatshirt on the plane so I can create a cocoon if I need to sleep. I'll plug in my earbuds, cover my face with an eye mask, and pull the hoodie over my head to create my own sleep chamber. I always travel with a throw because the plane is always so cold. I put this over my legs and sometimes I even put a throw over my head when I need to sleep. When I'm not wearing a T-shirt, I'll slip on a stretchy dress. This long-sleeved rib knit dress is perfect for long-distance flying (or short), and I'll often wear tights underneath so my legs aren't cold. Flats are my go-to when flying, and these Jenni Kayne shearling mules really elevate my look while keeping my feet snug and warm. I just discovered this brand and I'm hooked. Its socks in-built compression to keep your feet from swelling and relieve pain on the plane. The copper energy blend fabric also eliminates the growth of bacteria and microbes. I always wear socks when flying so my feet are covered when I have to remove my shoes through TSA. I'll often wear socks and slides on the plane because they're easy to remove when you're going through TSA. This style is really bouncy and has a lot of cushion in the sole than other slides I've worn. When I'm not in tights, I'm usually wearing stretch leather pants. These J Brand leathers are the original and the best, in my opinion. They are very comfortable on a long flight, but the beauty of these is their versatility. You can make them look casual with sneakers and a T-shirt on the plane then dress them up with heels or boots at your destination. I love to keep my airport outfit simple, but I never travel without a blazer. Even if you have the simplest outfit on, a well-cut blazer will elevate it instantly. I love the shape and fit of the Camilla and Marc jackets. The gold hardware really adds a little pop and sparkle too, something we all need after a long flight.